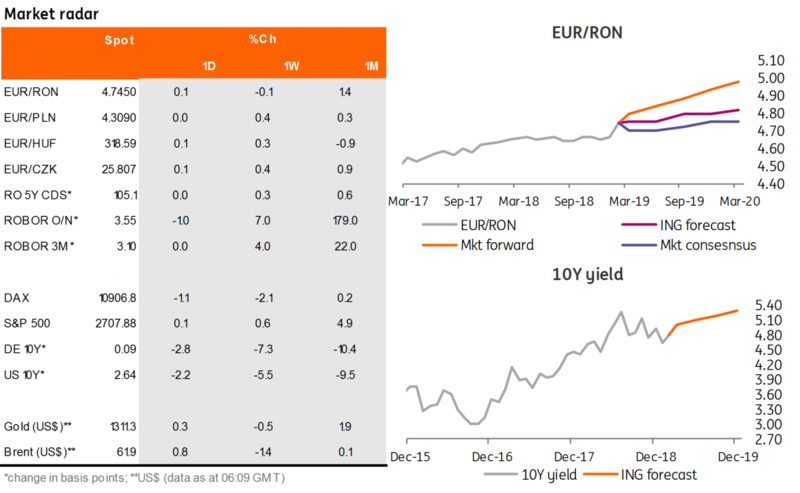 It’s back to basics for the EUR/RON, with the pair’s volatility and turnover moderating significantly relative to the first few weeks of 2019. The pair closed on Friday with a mild upside trend, around 4.7450. As we expect carry rates to inch lower over the next couple of weeks, the upward pressure on the pair could increase. Buying interest in Romanian government bonds intensified on Friday after news emerged about increased government flexibility on the bank tax review, though it is not clear if the government is on the same page as the central bank in terms of the foreseen outcome. Yields in the mid-segment of the curve inched lower by c.15 basis points. ROMGBs yields are now at similar levels to those before the bank tax was announced in mid-December. In the meantime, of course, we've had the Fed-induced rally and obviously, some positive changes to the bank levy are likely already priced in. Today the Ministry of Finance plans to sell RON300 million in its April-2026 auction. The tenor is a bit outside the range of typical ALM investors, hence we expect demand to be a bit more choppy and allocation around secondary market mid-levels of 4.45%. Cash rates are steadily coming our way – lower that is, after closing below 4.00% on Friday and they look set to dip below the Lombard level of 3.50% today. The curve is thus flattening again as the back end didn’t follow the downside move to the same extent as the front end. For the week ahead, eurozone industrial figures will be watched anxiously as German data has already been poorer-than-expected. The slowdown in eurozone industry has been at the forefront of everybody's mind but the question remains, how deep it is and how long it will last. That said, although German data has been weaker than expected, domestic demand likely prevented the economy from falling into a technical recession. In Poland, we expect GDP in the fourth quarter to slow down from 5.1% to 4.8% year-on-year. The annual 2018 reading, which was published last week, suggests a moderation of both private consumption and investment. In the US, we'll get the delayed December retail sales and durable goods order numbers, but 4Q GDP won't be released for another couple of weeks. We will also be looking for news on trade-related issues, particularly clues about whether the US determines the car industry to be a national security issue. If this is decreed by 17 February, this could see tariffs eventually applied to imports, which would heighten fears of escalating protectionism. On the local front, we expect the EUR/RON to oscillate within a 4.7400-4.7600 range.